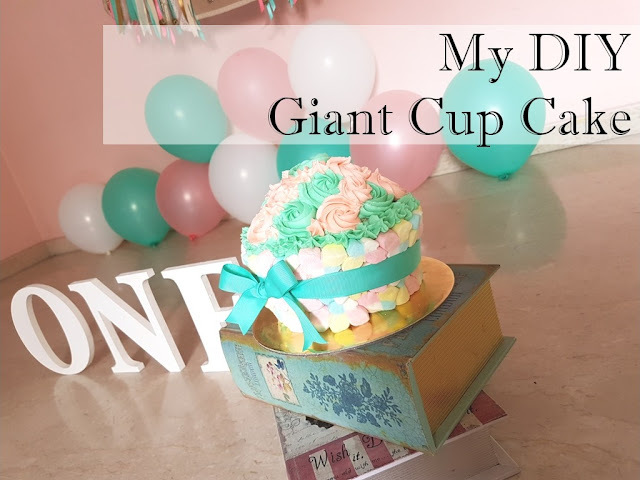 I had a vision to create a Giant Cupcake when I chanced upon a random youtube video earlier this year, featuring a cute little girl playing with a giant cupcake. 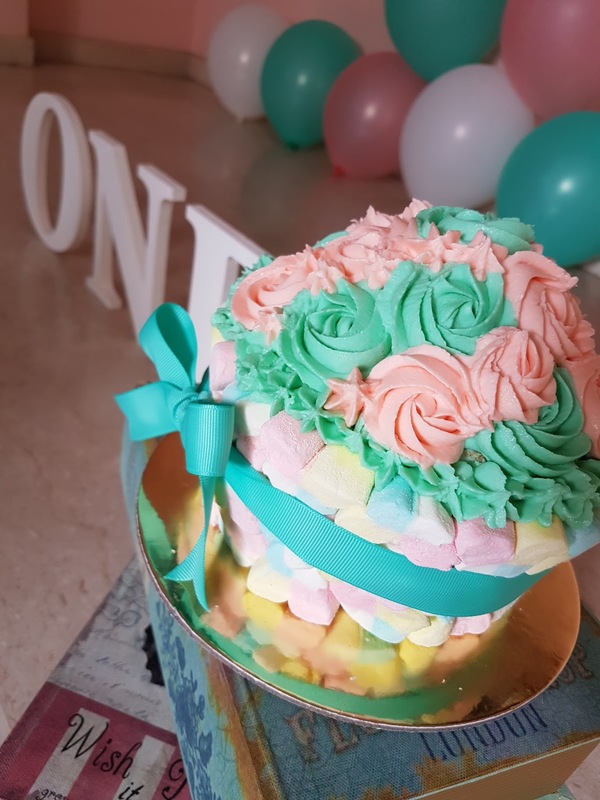 That is when I learnt of the term "Cake Smash" which is usually done to commemorate baby's first year! Since then, I have been looking out for photo studios, cake smash cakes as well as the appropriate backdrop and attire for Hannah's first Birthday Cake Smash. 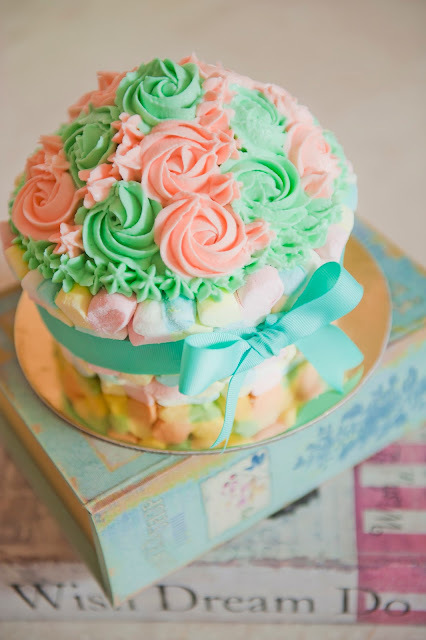 Unfortunately, I have not been able to find a reasonable priced cake (so far, many quotes I have seen are above $50, which I am unwilling to pay for). Hence I toyed with the idea of baking my own giant cupcake, like the one in the video! 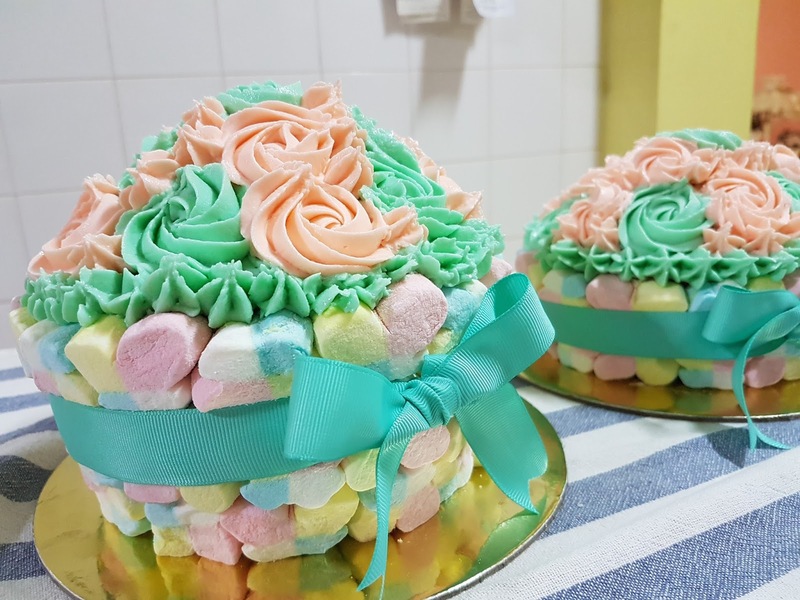 So here is my first Giant Cupcake experience - there are 3 PARTS to it. 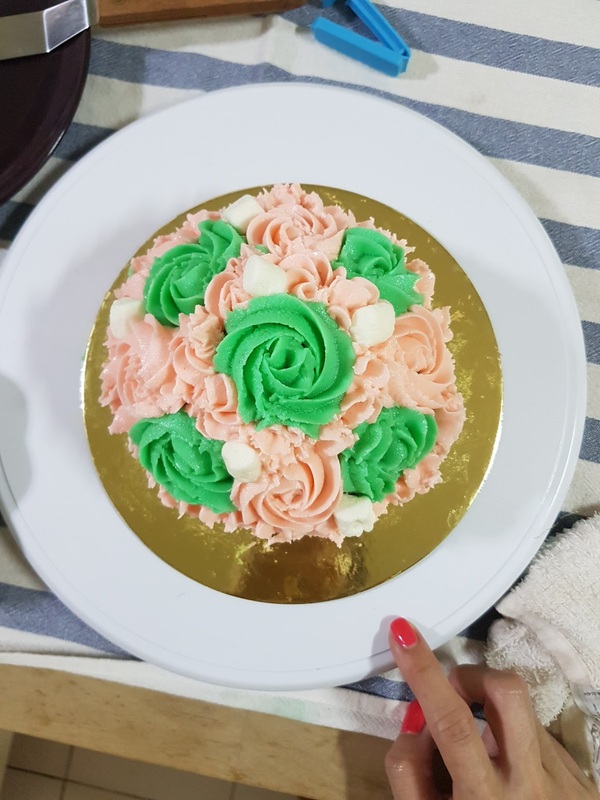 FIRST part is on baking the cake itself; SECOND part is on making the butter cream frosting; THIRD part is to pipe rosettes all over the cake. In the end, I used a total of 5 eggs (with the corresponding increase in sugar and flour) for the ACTUAL photoshoot Giant Cupcake. Take out the eggs from the fridge ahead of time or soak them for a few minutes in a bowl of warm water. Butter (or spray with baking spray) a 20 cm (8 inch) pan. 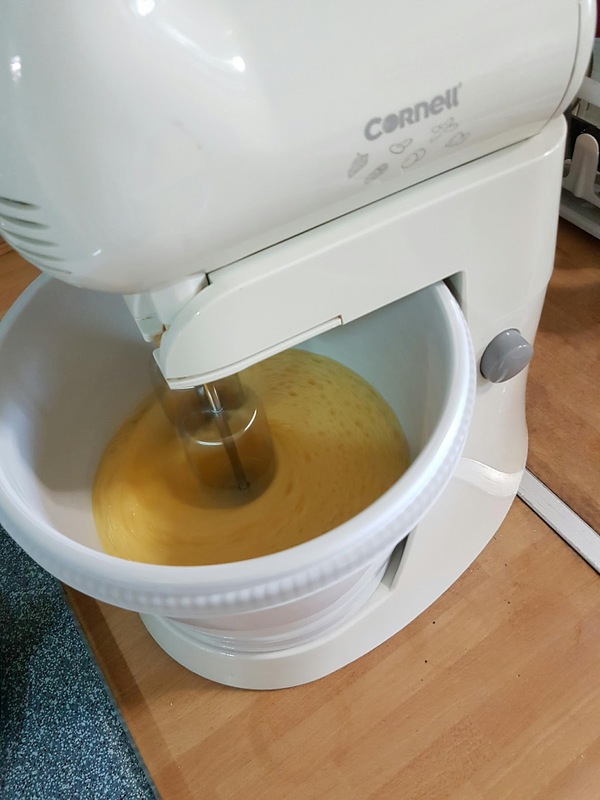 Put the eggs, sugar, and lemon zest in the bowl of your stand mixer. Beat the eggs until very fluffy and pale yellow (about 15 minutes on medium/high speed). 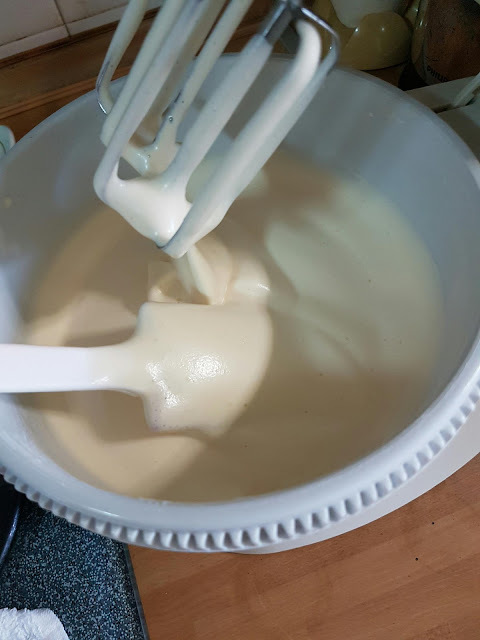 To test that it has been beaten enough, let some of the mixture fall into the bowl, if it remains "sitting" on top it means that it's ready. Turn off the oven but leave the cake inside (put a wooden spoon to keep the oven door slightly open) for at least 10 minutes so it can cool down slowly. 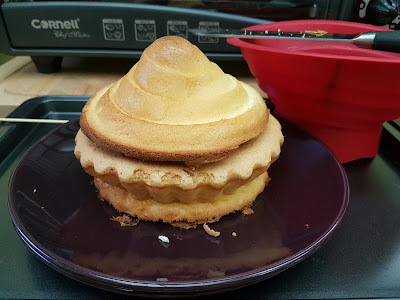 After that, remove it from the oven, let it cool 10 more minutes, loosen around the edges with a knife, then flip the cake on a wire rack upside down (without the pan) to cool completely. Let's start baking the cake! So, as per instructions, all started well. I had started to preheat my oven and greased my giant cupcake mold. 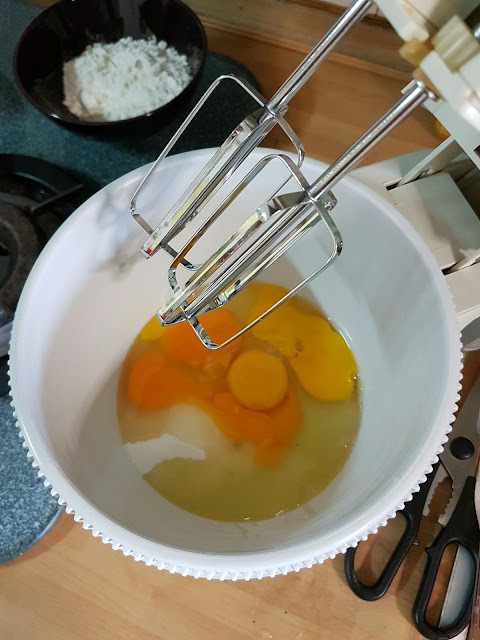 Step 1: Mixing the eggs, sugar, and vanilla essence together and whipping it on high speed for 10 - 15 mins. Now, the mix is frothy and fluffy and we are ready for the next step! And this is where I got it all wrong! 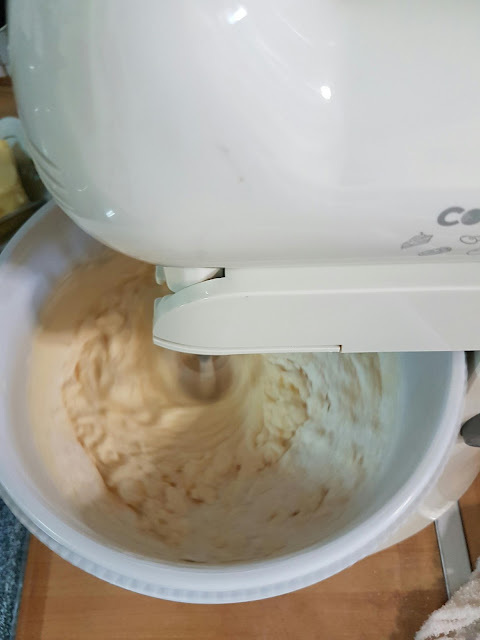 For some reason, I totally don't remember I needed to FOLD IT IN and NOT whip it using a mixer! 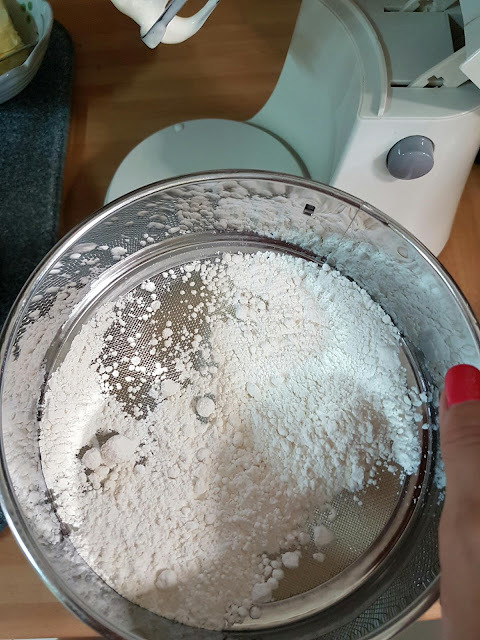 So I continued sifting and whipping and sifting and whipping until all the flour was in the mixture. 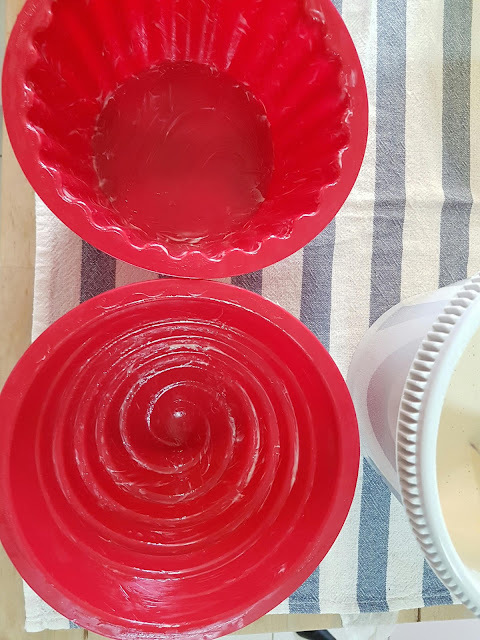 This is the greased my Giant Cupcake mold where I poured the mixture in. 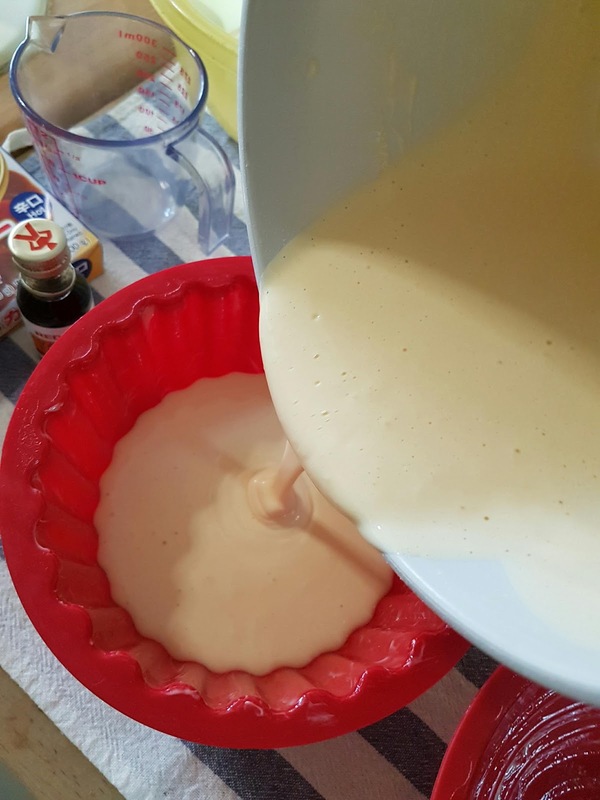 Step 3: Place the mold in the oven and work on the cream. 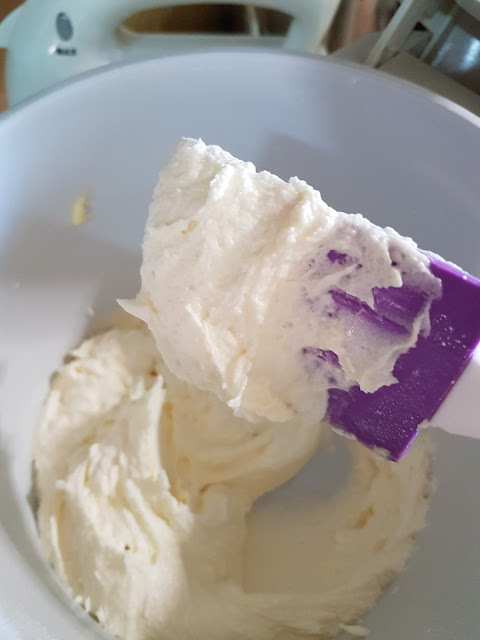 This recipe was from my tattered recipe book where I trialed and error a few times from the past baking projects and this is my best recorded buttercream mix. In the end, I used a total of 280g of Butter (double the amount of the above) for the ACTUAL photoshoot Giant Cupcake. Mix the butter using mixer on high speed and add sifted icing sugar bit by but making use noth ingredients are fully incorporated. 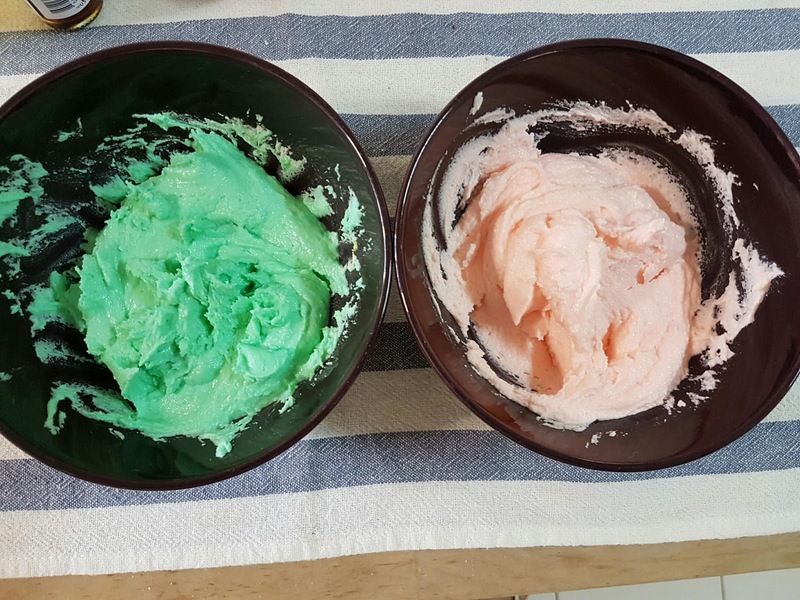 Since I have decided on the theme to be pink and mint, the color needs to be mixed into the otherwise cream color butter cream. 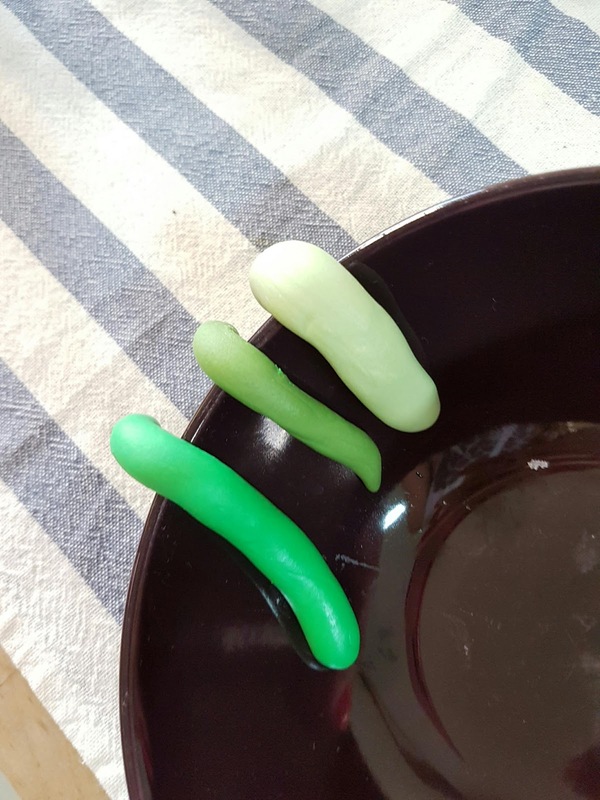 NOW, how did I manage to get the mint green color mix? This is a real challenge cause I am very particular about the green I want. It is not the normal leaf green, nor lime green, not pastel green and not even the tiffany green, it has to be MINT. And finally I stumbled about this color chart from Food Network and IT WORKS (well, sort of)!!! All you need is in fact the 3 basic food coloring colors of RED, BLUE & YELLOW. 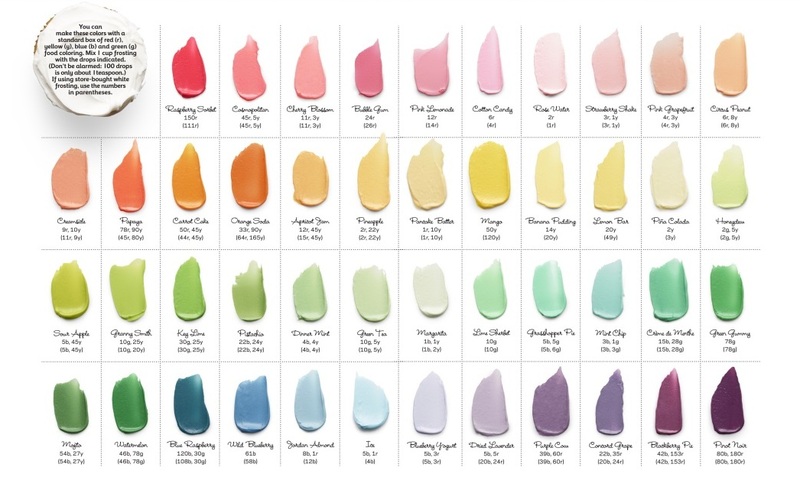 Please download this food coloring chart here from @foodnetwork. So, the mint I wanted is on the 3rd row from the top, 2nd green swatch from the right. The jargons in there was a little confusing, indicating 15b, 28g which I assume was 15 (drops) of Blue and 28 drops of Green, so what I did was simply to convert it into a ratio form which is an estimate of 1 unit of blue : 2 units of green. Instead of trying the colors on cream (and wasting the cream, I tested it on fondant first!). And since I am using gel coloring, what I meant by 1 drop = 1 toothpick "poke". The left most color is the mint color I was looking for. 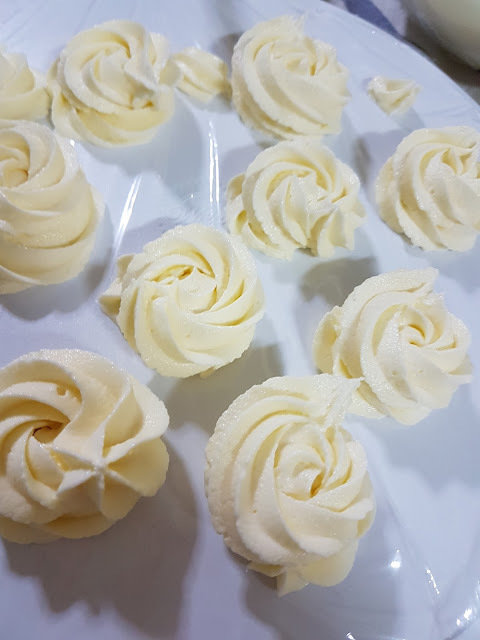 There are a few piping tips that can pipe a rosette and the one I chose was 1M tip from Wilton, simply cause I already own it. 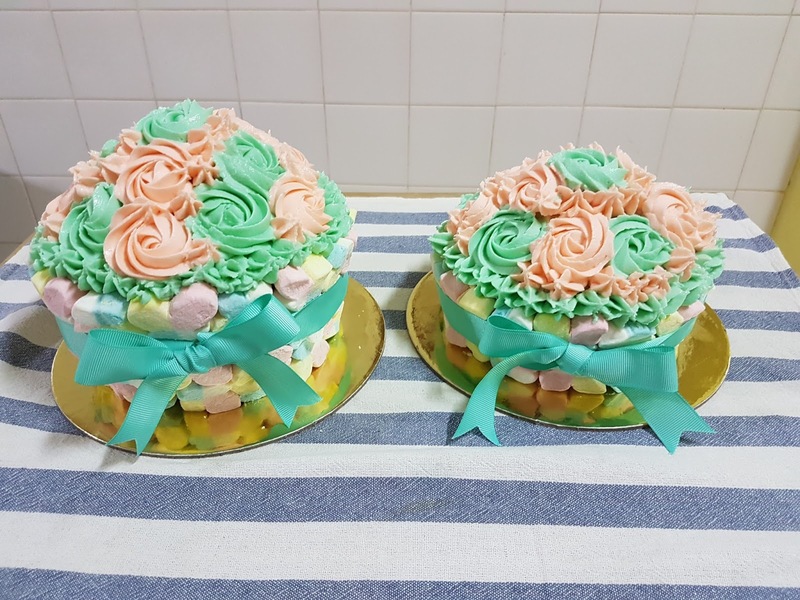 You can watch the following videos (which are my favourites among the many) to get familiarized with the technique of piping a rosette. 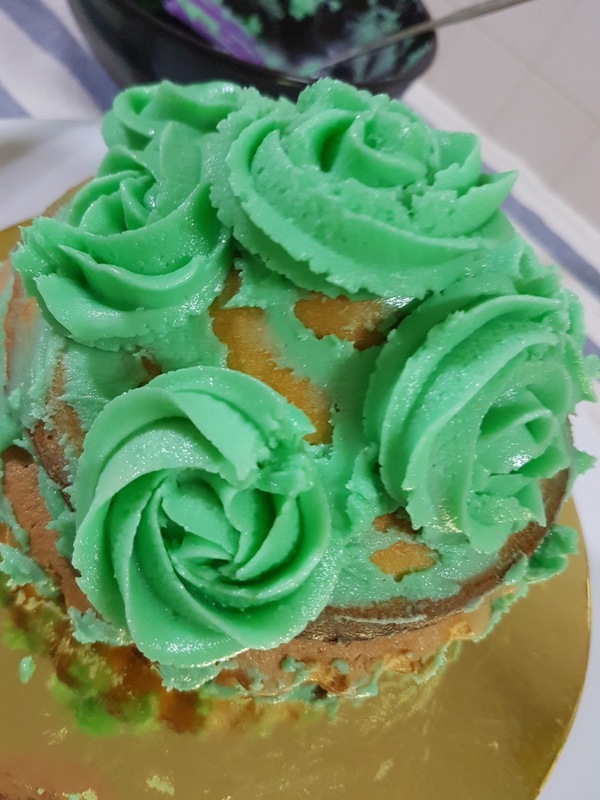 My finished trial cupcake that was collapsed in the middle (possibly due to the mistake I made while I prepared the batter). 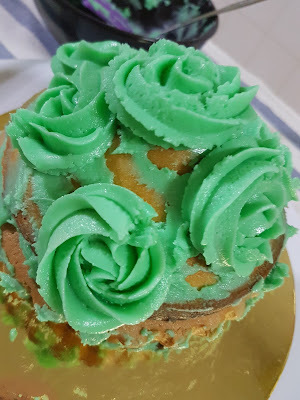 My first try at piping rosette on the top of the cupcake. On close observations, the cream texture appeared slightly grainy and I believe it was due to not piping the cream immediately after preparing it as I stored it in the fridge and took it out later to let it warm up to room temperature and was too lazy to re-whip it again. Obviously, I wasn't too impressed with this trial of mine, so I did abit of practicing for the piping technique. Alas, this was the Giant Cupcakes that I prepared for the actual photo shoot turned out just as I wanted. Perfect practice does make perfect. I am extremely proud of this actual, completed Giant Rosette Pink & Mint Cupcake!